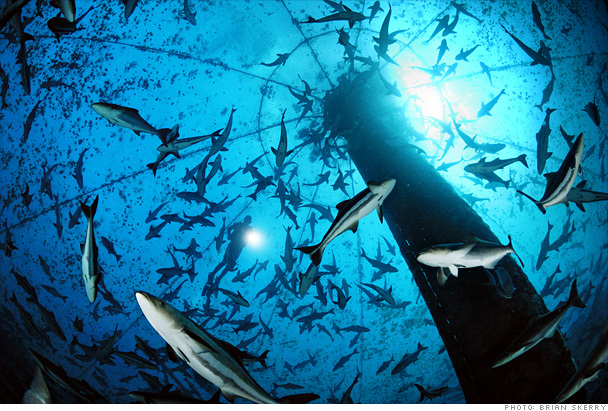 P’fish’ers, take a moment to check out this feature story in Fortune/CNN Money about open-ocean aquaculture. The story describes the company Ocean Blue Sea Farms which is raising cobia in Panama. See more about sustainable open-ocean aquaculture at the Ocean Stewards Institute. Passionfish celebrated its 5th Annual Poisson d’Avril (April Fish Day) with a group called Chefs Sustaining Agriculture managed by our very own Director of Culinary Education Gerard Viverito. 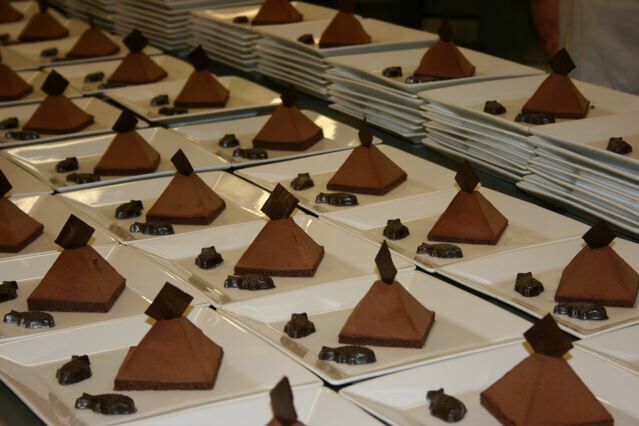 The event on Saturday, April 4, at The Culinary Institute of America in Hyde Park, New York, involved culinary students who designed, prepared and presented the menu. Gerard is an Associate Professor in Culinary Arts at the institute. The event started with an educational forum on seafood sustainability featuring panelists Roger Berkowitz, President/CEO of Legal Seafoods, Inc.; Chef John Besh, Chef/Owner of Besh Restaurant Group; Chef Ed Brown, Executive Chef of Eighty One Restaurants; Claudia Houge, Marketing Director for Alaska Seafood Marketing Institute (ASMI); Chef Rick Moonen, Executive Chef of rm seafood; and Chris Moore, Chief of the Partnerships and Communications Division at NOAA Fisheries Service. Producers who donated products included ASMI, Atwater Estate Vineyards, BIJA Oil, and Wild Hive Farm. And, once again, we were honored to have the participation of Scharffen Berger Chocolate Maker via the Artisan Confection Company. 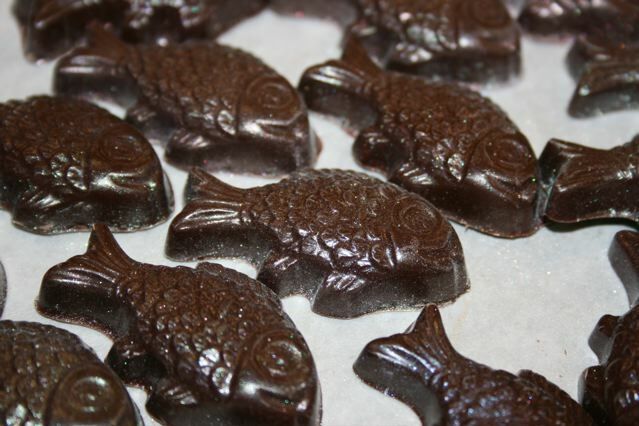 Check out the fish-shaped chocolates! 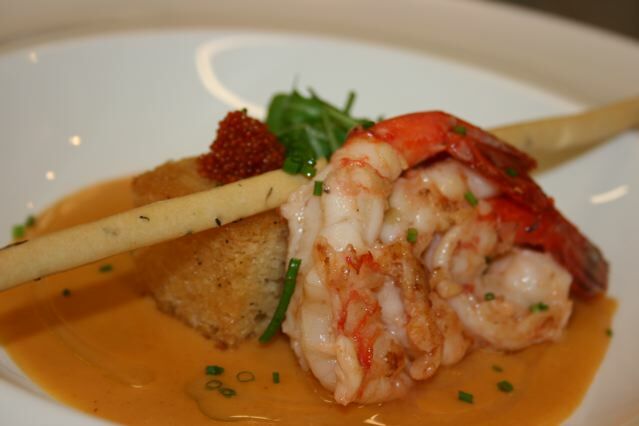 The meal began with Alaskan spot prawns seared and presented with a saffron bisque sauce, wilted arugula and roasted shallot oil croutons and an almond oil drizzle. This was paired with Atwater Estates Vineyards Chardonnay. Next, guests were treated to a crisped Alaskan king salmon with Wild Hive Farm polenta, fava beans, spring peas, pea tendrils, with Meyer lemon-infused organic olive oil and carrot coulis. This was paired with Atwater Estate Vineyards Dry Riesling. 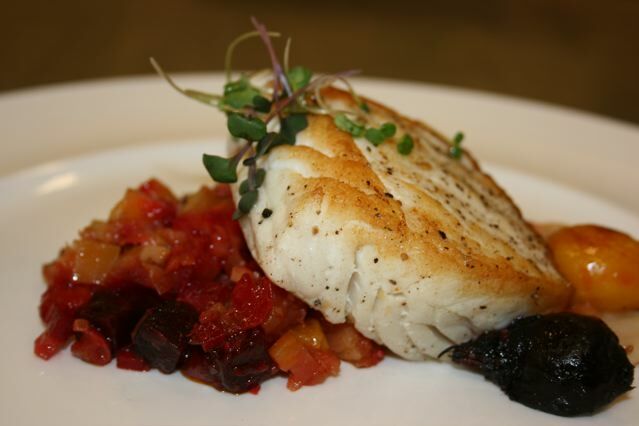 The “main event” was an Alaskan halibut with red flannel hash (local potatoes, root vegetables and chorizo). This was paired with Atwater Estates Vineyards Pinot Noir. The finale was a chocolate dome cake with the chocolate fish. Read about Passionfish’s Poisson d’Avril, our annual celebration of fish and mischief. OceanCommotion is © Passionfish 2019.